It’s rare to see a company make an almost perfect product. It’s even rarer to see one improve an almost perfect product. And yet, here we are. Sony’s already incredible MDR-1000X wireless, adaptive noise-cancelling headphones got an upgrade earlier this year and dropped the price to $350. I’ve been testing the new model for a few weeks now, and let me tell you, they’re so good you’ll probably want to upgrade from your Bose. The new WH-1000XM2 headphones look just like the old model, save for a couple key design upgrades. There’s a slight adjustment to the look and feel of the headset. The outside part of the ear cups is a different material that I would describe as gravelly-looking plastic but not in a bad way, as the first generation MDR-1000X headphones featured leather on the outside of the ear cups that looked nice but was prone to dings and scratches. Overall, the design is clean and timeless. The more obvious change is the removal of a third button that controlled the headphones’ ambient mode. That functionality has been added to the noise-cancelling button which is handy, because you can switch to ambient mode or turn noise-cancelling off really easily. There’s also the adaptive noise-cancelling. It is even better than it was in previous models. So good, I think it knocks the Bose QuietComfort 35 headphones off its throne. Sony is now king of noise-cancelling. What’s especially handy is an all-new Sony Headphones app that lets you adjust the noise-cancelling, reverb, equalizer, and even the sound direction. This means that if you can make it sound like your music is coming from the left if you maybe need to hear better on your right. There’s also a new feature called Atmospheric Pressure Optimization that’s supposed to make everything work better on a plane. I tried it on a recent flight, and it seemed to work. I couldn’t hear anything but my music! The app also includes a neat new feature called Adaptive Sound Control that adjusts the ambient sound settings based on what you’re doing. This means that you can do full noise-cancelling while you’re sitting down but let in more ambient sound when you’re walking down the street. Finally, you can activate yet another feature that lets you hear voices more easily. Speaking of control, the right ear cup is touch sensitive so you can do cool stuff like swipe up to increase the volume or tap to pause your music. However the controls could be finicky, and I found it just a little too erratic for my taste. Another new thing is the ability to put your hand over the right ear cup, and the music and noise-cancellation will turn off until you take your hand away. This is supposed to make it easier if you need to talk to someone but don’t want to take off your headphones. I used this feature exactly once. An up close of the gravelly plastic ear cup material. The microphone for noise-cancelling also got a slight design upgrade that makes it blend in better with the rest of the headset. So many features! Yet the most important one is sound quality. 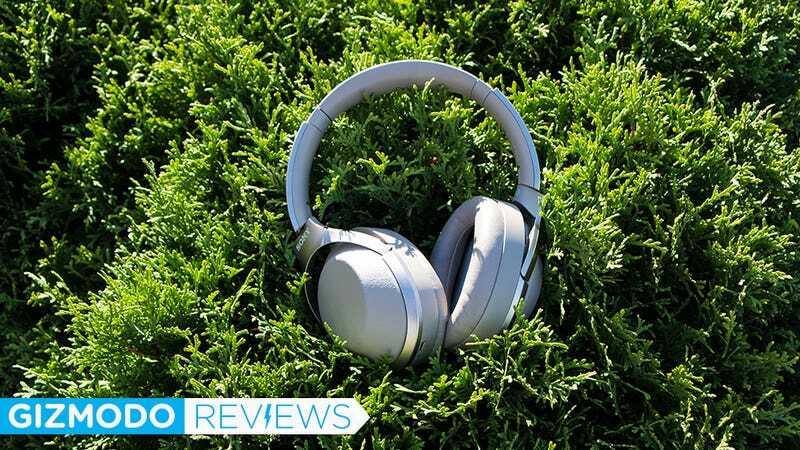 Guess what: the Sony WH-1000XM2 headphones sound great, especially if you’ve been listening to Bose headphones, with their notoriously neutral sound, all these years. 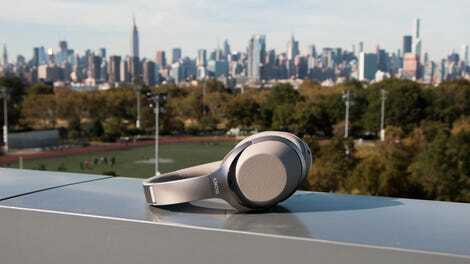 Being Sony headphones, the bass is particularly fantastic—clean, smooth, not trashy. There’s one low note on “Revolution” by Diplo that I’ve only ever heard on one other set of headphones, and I can hear it on these headphones. (The other pair were also Sonys.) On the treble end of things, I noticed a little bit of distortion on “Forgot About Dre” by Dr. Dre and Eminem. That might be the song’s fault because the flute solo on “Locomotive Breath” by Jethro Tull sounds awesome on the new Sony cans. I saved the best part for last, though. This things last 38 hours on a single charge with no noise-cancelling on. Even with noise-cancelling, you’ve got a 30-hour battery life. I’d plug them in every two or three days, and hard as I tried, the headphones wouldn’t die on me. The battery life is even better than the new Beats Studio3 Wireless with Apple’s fancy W1 wireless chip. While I’m usually an all-black kind of guy, I actually quite like the gold colorway. I’d call it more of a champagne, though. Normally I would now point out the bad stuff I haven’t already mentioned. Honestly, I’ve got nothing. Beyond the finicky nature of the touch sensitive controls these are damn near perfect. If I were going to recommend a set of wireless headphones that cost less than $400, the Sony WH-1000XM2 headphones would be the recommendation. They look great. They feel great. They sound great. They cancel noise great. And they have more ways to tweak and fiddle and personalize your experience than you’d ever want. Sorry Bose. You got beat. Correction: An earlier version of this post had an incorrect model number for the Sony headphones. The correct model number is WH-1000XM2.